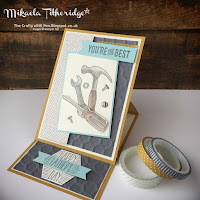 Welcome to the Crazy Crafters' Blog Hop with our Special Guest stamper, Mikaela Titheridge - we are thrilled to have Mikaela join us this month and so excited to CASE (Copy And Selectively Edit) any project that has been created by her. I spent a lot time looking through Mikaela's blog because it was so much fun - and I ended up with a huge list of possibilities to case! 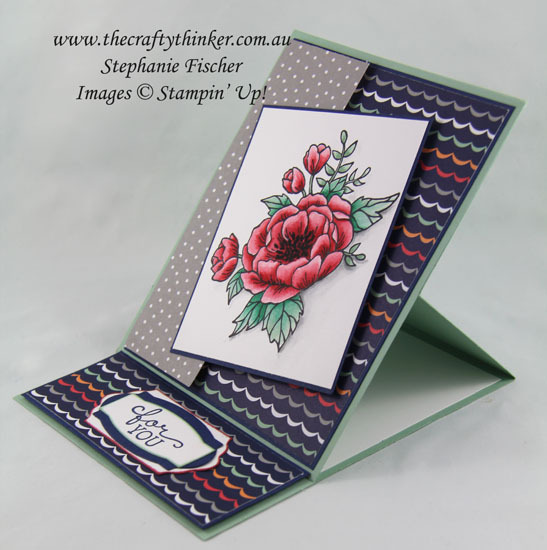 But, in the end, I chose this card because I liked the way Mikaela added her layers and I just love easel cards! 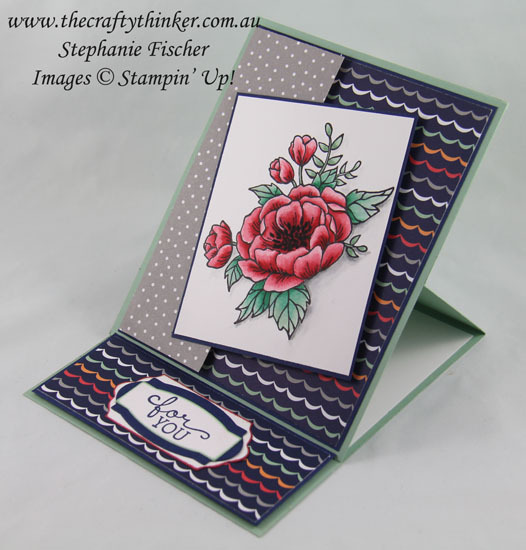 I decided to use one of my very favourite stamp sets - Birthday Blooms and some of the gorgeous paper from the Carried Away Designer Series Paper which I received free during Sale-A-Bration. Sadly Sale-A-Bration is now over and we'll have to wait another year for all those great freebies! I selected the colours for my flower and the card base from the colours in the paper, using Mint Macaron and Watermelon Wonder with Smoky Slate for the shading. 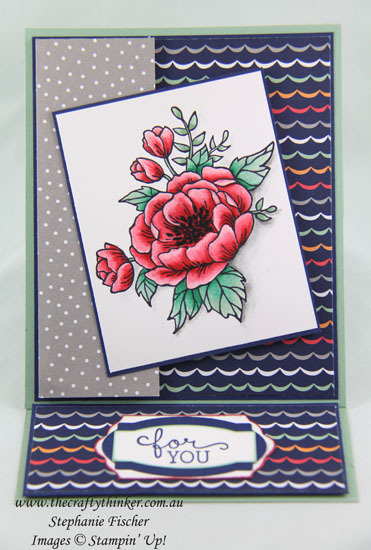 I also used some Flirty Flamingo and Emerald Envy to create the depth I wanted in the flower. I watercoloured the flower, this time using a good old-fashioned brush and water rather than an Aqua Painter because I used Whisper White cardstock (rather than Watercolour paper or Shimmery White card stock) and, therefore, needed enough control to be able to use the minimum of water. Once I'd finished painting, I layered my floral panel onto a piece of Night of Navy cardstock. I stamped the greeting in Night of Navy ink onto Whisper White and cut it out with a die from the Project Life Cards and Labels framelits. I sponged the edges with Mint Macaron ink and layered it onto a Night of Navy label cut with a die from the Rose Garden set. In turn, I layered that onto a piece of Whisper White that I cut with one of the Lots of Labels framelits edged with Watermelon Wonder. The use of Adhesive Foam strips gives the panels the appearance of almost floating on top of the background paper.